Live for Today. Hug a Local. 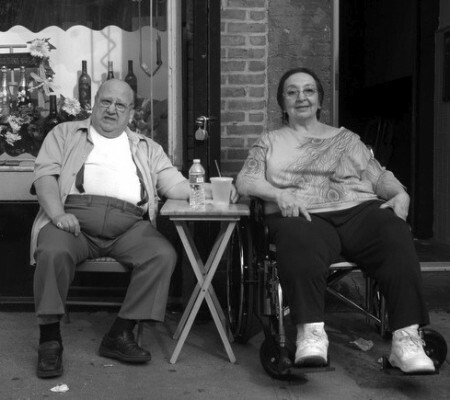 Vinny and Mattie Cappole, Carroll Gardens residents since birth. Married 49 years, Vinny was born in Brooklyn Bread building on Court. Many of the old-timers in the Carroll Gardens neighborhood aren’t too pleased with us new “yuppies,” as they like to call us. Their families came over from Italy roughly between 1920 and 1970–they struggled, worked hard, lived in small apartments, scraped together to run family businesses. The folks who are here stuck it out when times got tough in the 1980s and everyone was selling their homes for peanuts. It’s been quite a transition from Carroll-Gardens-as-Little-Italy to Carroll-Gardens-the-new-“It”-neighborhood. In a way, there are some rough and untrusting feelings on both sides, between the newcomers and the old. But hey–we are moving into their neighborhood. So let’s say Hi. Strike up a conversation. Share a smile. Why not? Read our exclusive inside look at a battle of the sexes, and between old and new, in the Italian-American community of Carroll Gardens.